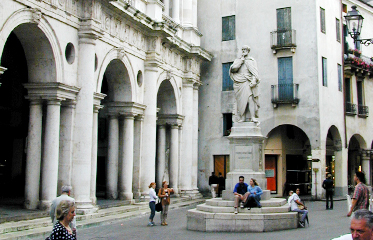 Most of the buildings on this central Vicenza square are designed by a famous renaissance architect Andrea Palladio (1508-1580). 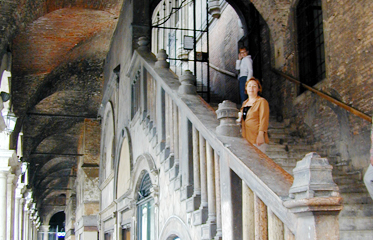 He is immortalized with the monument here [small photo in the middle bellow]. 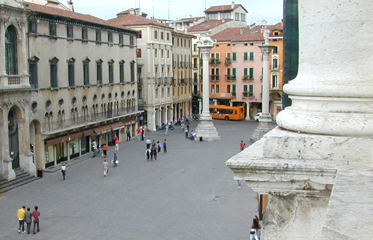 All of the structures were renovated and proportions and atmosphere on this pedestrianized square was preserved. My opinion is that the missing link is some innovative way of usage. Piazza is most of the day, even in the tourist season, quite empty and without any content.